"If you're a student thinking about graduate school...consider this post a friendly reminder: Don't be J. Randomstudent." Also: DON'T APPROACH YOUR PROFESSOR AT THE LAST MINUTE!! GIVE AT LEAST ONE MONTH'S NOTICE IF AT ALL POSSIBLE!!! "If Obama is going to stand by that failed policy, he should at least explain his thinking in depth. It might even get more hits than a fundraising video. " Article about "source amnesia" which leads people "to forget whether a statement is true. Even when a lie is presented with a disclaimer, people often later remember it as true." "Jane Hamsher of Firedoglake and former Rep. Bob Barr, Libertarian presidential candidate, discuss why the FISA bill is succeeding." "cool new tools and services to create presentations online, arrange your pictures in slideshows, record any region of your screen, and also to download YouTube videos and add captions to them." Patrick Meier has done some great blogging from the Global Voices Citizen Media summit. This is just one of his many posts. "How do 70 opinionated people from around the world make up their collective minds?" "There are a lot of situations where we end up with cultural misunderstanding and failure to communicate due to a failure to consider the audience of remarks." "If there’s a single subject that gets bloggers excited, incensed and interested, it’s elections." "I’m blown away every time I read about the work the Rising Voices grantees are doing..."
"In our conference room, we’ve got an amazing cross-section of free speech activists in censored nations - several people introduce themselves by talking about their banned websites, or the prison sentences they’ve served due to their online speech." The public part of the Global Voices Summit is over, and the blog posts about it are piling up around the web. But the meeting continues for GV project participants, website contributors, editors, and others who are actively involved with our growing citizen media community. We're nearing Day 1 of two days of internal planning and brainstorming meetings in which we try to figure out where to take the project in the future. Ethan has a great post about the techniques David Sasaki, Georgia Popplewell and Solana Larsen have devised to unearth ideas and foster discussion amongst this multi-cultural, multi-lingual group. The 2008 Global Voices Citizen Media Summit has now begun. If you're not in the room you can watch the live webcast here. A live IRC web chat is taking place on freenode.net at #globalvoices (join from mibbit.com if you aren't familiar with IRC clients). There is also a liveblog, a Flickr tag, Twitter feed, etc. The program for today and tomorrow is here. Slides from yesterday's smaller GV Advocacy meeting are now online here. Hopefully many of today's presentations will also be added as the day progresses. I will write more about the meeting in the coming days. Meanwhile, here is the post I wrote after the 2006 Global Voices Delhi Summit. Jeff Jarvis outlines 10 questions that news organizations should be asking now. "there’s a role educators can be playing to help prep students to be better online citizens, including acting as citizen journalists to document what’s going on in their community, promoting what’s working and demanding fixes to what’s not." Kaiser Kuo: A Funeral Dirge for 56.com? "Sequoia was told that the company had been given multiple content-related warnings, but that the problems had gone unaddressed. The upshot is that the ban is not going to be lifted." "Modern authoritarianism is a basically centrist proposition; bound up with and justified by a combination of patriotism and performance legitimacy rather than ideology. It operates on a spectrum that allows some forms of participation and debate." 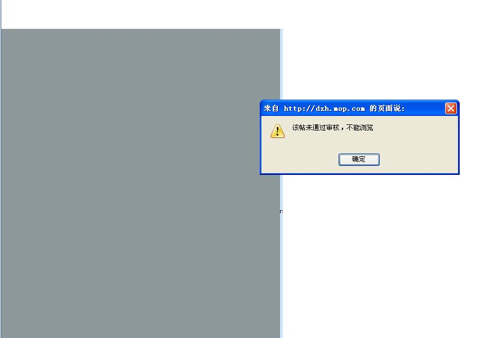 The string of political events this year is turning the website Xiaonei.com for Chinese university students into a political hotbed.
" "Like reluctant migrants everywhere, the people in the news tribe have to decide what to take with them, when to leave, where to land. They have to figure out what is essential to their way of life... They have to ask if what they know is portable." 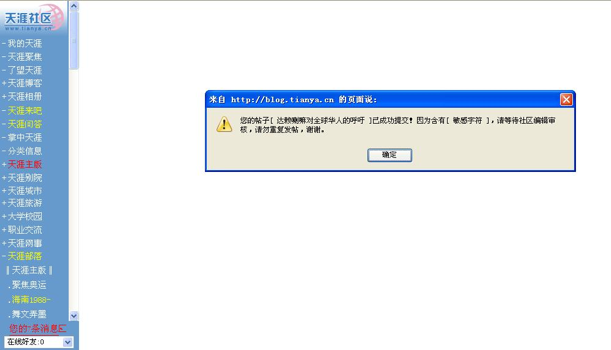 "it is rather remarkable that Baidu has introduced a consistent censorship notification mechanism....It also suggests an increasing openness within China concerning censorship and informs Chinese Internet users.."
Ever since June 3rd, visitors to 56.com, one of China's video sharing "YouTube clones," have been unable to access any other part of the site, other than this message below claiming that the site is undergoing "maintenance" and a "major upgrade:"
Due to the vast quantity of material, the message says that the process will require "a certain amount of time." Users' forgiveness is requested. Another YouTube clone, Tudou, had major problems earlier this year but is now back in operation after what insiders said was a major upgrading of their internal censorship systems so that sensitive video (sexual, political, and perhaps some copyright-violating) could be adequately vetted. On Monday, the Washington Post asked whether 56.com's troubles are the "beginning of Chinese government taketown of video sites?" According to a new report by the China Internet Network Information Center, as many as 160 million Chinese now watch online video. It's turning into a powerful mass medium. Thus it's not surprising that the propaganda authorities want to try and control it the way they control broadcast television. Jeremy Goldkorn, Loretta Chao and others have reported on the list of 247 websites whch the State Administration of Radio Film and Television (SARFT) has officially "approved to host Internet audio-visual programs" in China. 56.com, Tudou, and another YouTube clone Youku are conspicuously absent from the list. But even if the government did shut down the site, the move may not be a concern for neither rivals nor rival investors. 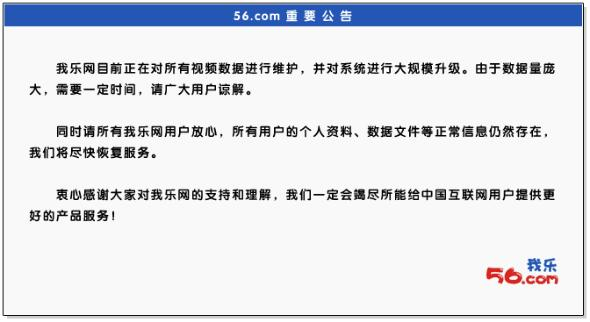 The most recent rumor I’ve heard going around in China is that 56.com wasn’t adequately censoring videos about the recent, devastating earthquake in China’s Sichuan province from the site. Both Youku and Tudou have assured me that they’re very careful about following government regulations, saying that because they are the largest sites in China, they face the most scrutiny from the government before getting approval. Both say they work closely with the government to ensure that content is compliant. The fact that Tudou only went down for a day or so in March, and that Youku went down for only an hour on June 4th (both incidents were also officially called technology problems) suggests that they are keeping the government satisfied. ...besides possible earthquake-related censorship, perhaps it is 56.com’s place at the intersection of video and social networking apps that could be behind its downtime. Could it be that 56.com has run out of money, or gotten close enough to running out of money that its investors have pulled the plug? ...Even all these things considered, it’s hard for me to believe that such marquee technology investors would want to shut it down. If nothing else, the combination of the company’s video and social networking services must one day be worth something more than they are now, if one has even a relatively low expectations for either category. Maybe it’s just a case of 56.com having less stringent filters than its peers in hopes of drawing in more traffic, in which case it might come back once it gets in line with the others. But the company and its investors have not commented on why it has been offline for nearly three weeks, and the longer it goes offline, the less likely it seems it will ever return. Even if the investors haven’t shut it down yet, the downtime may be the fatal blow against the company’s efforts to raise another, almost certainly necessary funding round. Another expense line which weighs heavily on Chinese video sites finances – and their management time - is content filtering. Video sites in China have to adhere to a very strict – yet ill-defined - standard of what content is permissible. In discussions with various online video sites contacted by BDA, company executives were at pains to stress how effective they were in filtering content, either through the dedication of superior numbers of personnel or through the deployment of more sophisticated technology – for example searching for offensive key words (to find a video amidst the torrent of content consumers need to start with a key word) or randomly sampling frames of content and detecting offensive uploads. Whatever the efficacy of these systems, as the volume of content uploaded increases the burden of hosting and filtering will inevitably increase. ...and Blogbus put *** over the President's name. What this shows is that companies are making different choices about how they censor...some more ham-fisted, some lighter, and some heavier, than others. The data presented in this report indicates that there is not a comprehensive system - such as a list issued by the Chinese government - in place for determining censored content. 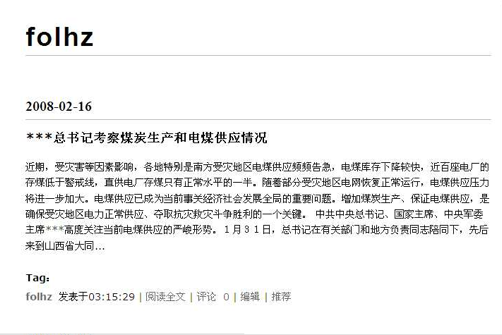 In fact, the evidence suggests that search engine companies themselves are selecting the specific web sites to be censored raising the possibility of over blocking as well as indicating that there is significant flexibility in choosing how to implement China’s censorship requirements. So what does this mean? Does this mean that there is room for companies to make choices about what they censor and how they censor it? And that perhaps some of these choices can lead toward at least greater transparency and accountability as far as the user is concerned? Those are some of the questions I asked our conference panel. Duncan Clark pointed out that the business culture in China forces companies to do whatever necessary to keep the authorities off your back - which means doing things like political censorship and cooperating with police investigations of dissidents that cause American companies to get hauled into Congress and yelled at. This pressure on domestic Chinese companies - and thus pressure on foreign brands that try to compete with them - is unlikely to change until these Chinese companies start having major business interests overseas in markets where they need to gain trust and respect of users who are not as tolerant of censorship and more likely to yell about civil liberties than their Chinese users are. Then, Duncan said, maybe they'll push back harder against Chinese government demands. Joshua Rozenzweig of the Duihua Foundation was of the view that this is going to be a long hard slog, and that it will be difficult for much to change until China acquires a truly independent judiciary and legal system that serves citizens and their rights rather than the government's interests. 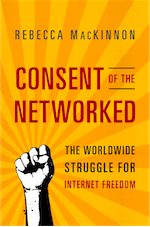 But he also pointed out that conversations about these issues are much easier to have when you approach these problems as global problems: that we have problems of governments pressuring companies to infringe upon individual rights everywhere on the globe. If people in China feel that they're being lectured by Westerners from a position of moral superiority, they won't be interested in listening, even if they might agree with some of what you have to say. I read the panel a quote from a recent article titled China's Holistic Censorship Regime, written for the Far Eastern Economic Review by an anonymous businessperson: "Ultimately, to succeed in China, businesses must assume the goals of the Communist Party as their own." Isaac Mao disagreed. Why? Because, he said, nobody knows what the Chinese Communist Party's goals are: the CCP doesn't make them clear, nor are the companies clear what the CCP really wants of them. At any rate, there's no monolithic "they" who express a unified "goal." Depending on which ministry or regulatory body you're dealing with at any given time - and which individual at which provincial or city level you happen to be dealing with - the message about what the "goals" are and what the priorities should be varies tremendously. It's the vagueness and uncertainty, Duncan agreed, which makes companies nervous and thus causes them to over-compensate, constantly trying to second-guess the regulators. How do you go up against a headless monster like this and get it to change? Or how do you convince compannies that they can change the way that they choose to respond to this headless monster, so that rather than encouraging it to be even more arbitrary and outrageous, they might instead respond in ways that might encourage it to evolve in a direction more compatible with rule of law and respect for individual rights? Josh of Duihua made a very important point: if you want to help encourage or lobby for a particular kind of change, first you need to figure out who in the government bureaucracy would benefit from that change. You need to figure out which businesses and other economic interests would profit from that change and how. You figure out who their opponents are in the bureaucracy and how it all fits in to the various inter-ministerial, inter-regional, and other power struggles. Then you will have a better idea of who is most likely to want to listen to you with an open mind, and who might even find your information useful to their own agendas. So. Where do we go from here? Any ideas, anyone? In reviewing Ma Jian's new novel, Pankaj Mishra observes: "A dissident writer’s pessimism, you suspect, can be as relentless and simplistic as a socialist realist’s optimism."